Unless you have been hiding under a rock for the last decade or so you know about the big push to make snowmobilers more aware of avalanche danger in the backcountry, and to have the necessary training to be in the backcountry. 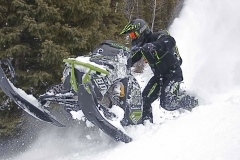 Snowmobilers, unfortunately, have been lagging behind the rest of the snow users such as skiers and snowboarders in avalanche awareness, training, and the purchase of avalanche gear. 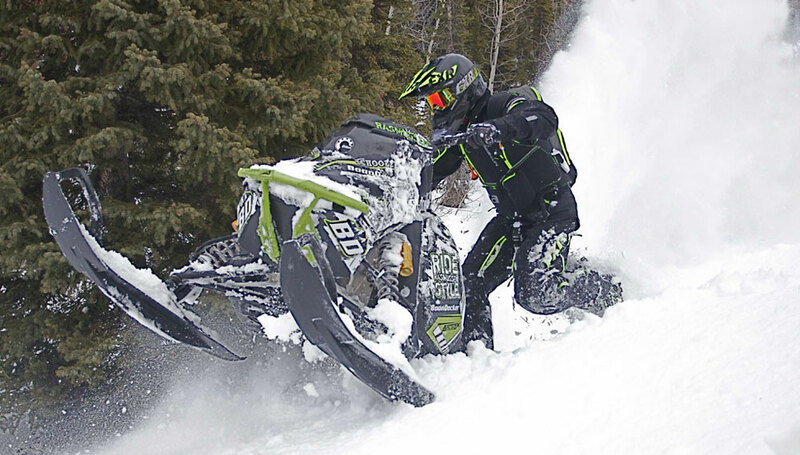 Snowmobilers make up a large portion of the snow sport backcountry users and snowmobilers also make up a large portion of the avalanche fatalities every year. 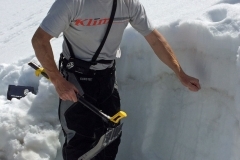 For snowmobilers to be safer in the backcountry where they ride, they need to improve their level of knowledge about avalanches, the safety gear available and, most importantly, how to use that equipment. 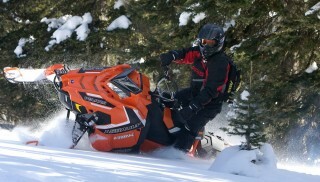 Mike Duffy of www.avalanche1.com is the most well know avalanche instructor in the snowmobile industry. He has spent 20 years teaching snowmobilers the dangers of avalanches and has been at the forefront of avalanche training and awareness. Twenty years ago Duffy realized that there were no snowmobile specific avalanche courses. In 2005 he started avalanche1.com to specifically instruct snowmobilers about the dangers of avalanches, instead of relying on a ski avalanche instructor that typically has a different perspective and outlook on terrain. 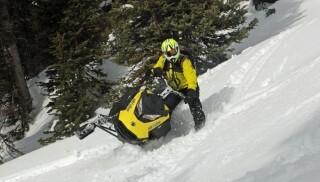 Duffy lobbied the OEMs to get behind avalanche training courses, stating that until the manufacturers pushed avalanche awareness, snowmobilers would continue to perish in the backcountry. Mike Duffy of Avalanche1.com demonstrates a method to to determine weak layer in the snow pack. 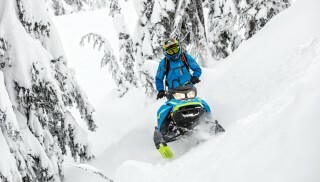 Ski-Doo is an example of an OEM that decided to take action and partnered with dealers and Duffy to offer free avalanche training classes over the last few years. Duffy has traveled all over the US to dealerships teaching four-hour training classes. Four hours is hardly enough time to become proficient at avalanche awareness and rescue techniques, but that is not the goal of the class. The goal is to increase awareness so that the individuals attending the course will seek out additional information and training. There are 3 levels of avalanche certification. The first level is the crawl to walk phase to get ready for the running phase level 2. 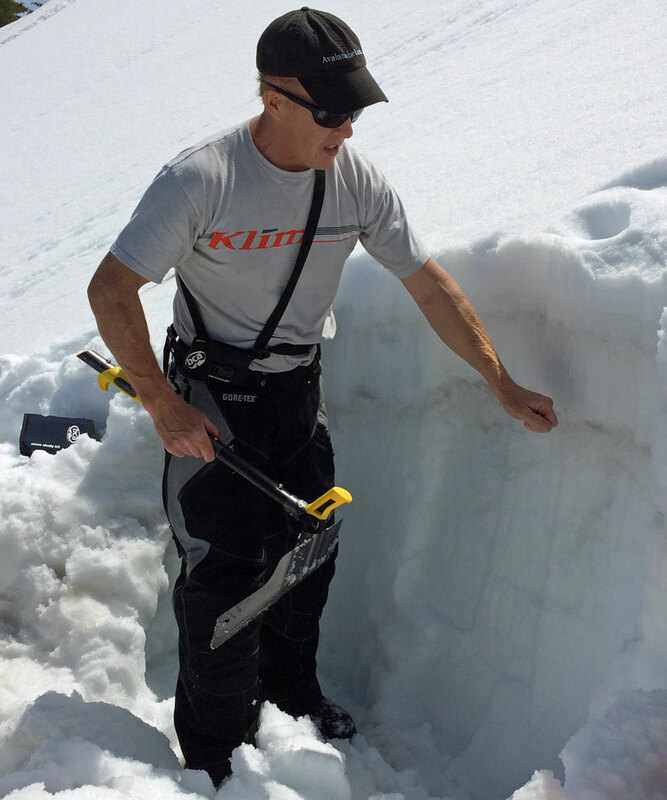 Level 3 certification gets heavily into the snow science of avalanches for professionals. Duffy mostly teaches level 1 classes that consist of a 24-hour period spent in the classroom and on the mountain, usually spread over two to three days. During level 1 students are taught to look for terrain and snow conditions that are conducive to avalanches, and teaches backcountry decision making skills. 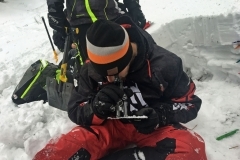 Students are also taught methods to efficiently use avalanche transceivers. 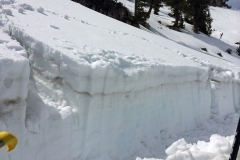 Snow stability tests are conducted on the slopes teaching students where the weak layers are under the snow. 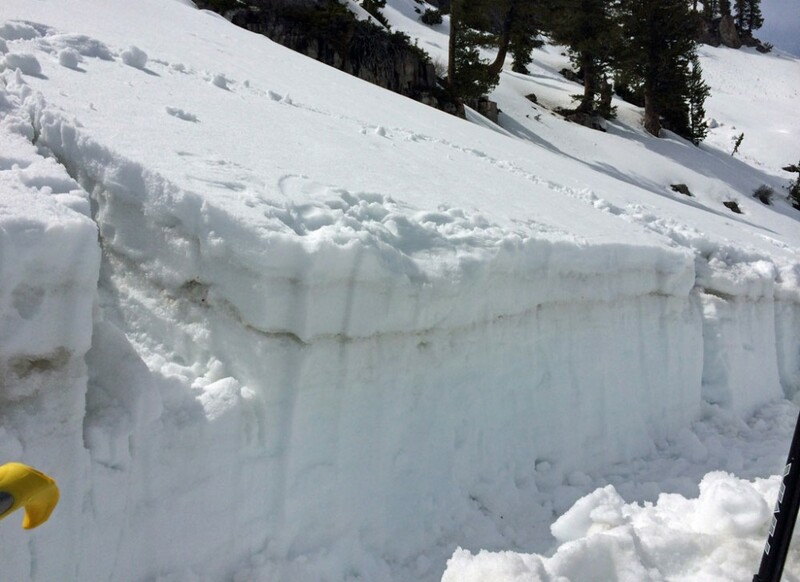 A snow stability test cut into a slope reveals where a slope is most likely to slide. Level 2 classes are approximately 32 hours, 60 percent of which is spent on the mountain, the remainder of the training is in the classroom. Level 2 continues to build on level 1, further improving transceiver search techniques, snow stability tests, and the ability to read the terrain. Level 3 also continues to build on level 1 and level 2, but this level is geared more for professionals, such as guides, instructors and avalanche forecasters. 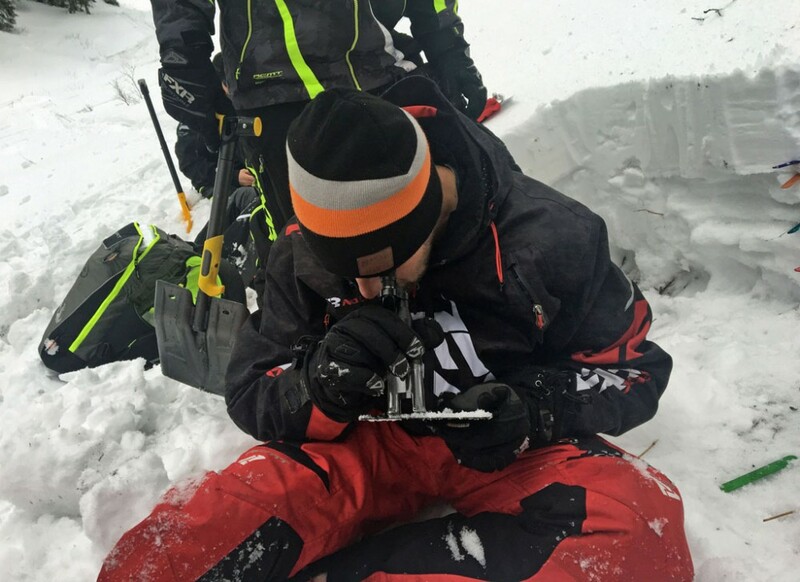 Advanced decision making, advanced search techniques, and advanced snow sciences skills are taught during level 3. Recently I was invited by Ride Rasmussen Style to join Bret Rasmussen and his instructors in attending one of Duffy’s classes. In an effort to have the highest rated avalanche instructors in the backcountry riding clinic business, Rasmussen has all of his instructors at an avalanche level 2 rating or higher. Nate Smoot, a Ride Rasmussen Style instructor, studies snow crystals during an Avalanche Level 2 class instructed by Mike Duffy. In our groups we would take turns being in charge and direct the rescue. We then split up as directed with shovels in one hand and an avalanche transceiver set to search in the other. The notional victims (avalanche transceiver stuffed into a bag then buried) were always the first ones found. The other two victims that did not have transceiver were much more difficult and we had to rely on visual clues, such as the tips of a glove or hat sticking out of the snow. Then we had to probe the snow to find the victim (another bag buried). For both of our groups doing the training our times were seven to eight minutes. This was at the end of our training where we were at the top of our game. Like many skills that are learned, these skills are perishable and these avalanche rescue skills must be constantly revisited in order to remain proficient. Avalanche knowledge and training is only something that most think about before their first ride in the fall. Since the knowledge and skill have remained dormant for six months or more during the summer, we all should spend some time honing them. Duffy says that a few key items can greatly increase your chance of survival if caught in an avalanche. Avalanche transceivers are the most common and well known and should be the first item purchased. The next is an airbag, which have come a long way in the last 20 years. Airbags have gone from very expensive, uncomfortable, with little extra storage space to affordable, comfortable, and all the storage space a rider desires. Airbags have become the norm rather than the exception in the backcountry. YouTube is filled with videos of snowmobilers in the backcountry deploying their airbags with great results. The truth of the matter is that airbags do work and keep an avalanche victim above the snow. A rider that is above the snow reduces the chances of burial and trauma from striking rocks, trees and other debris below the snow. 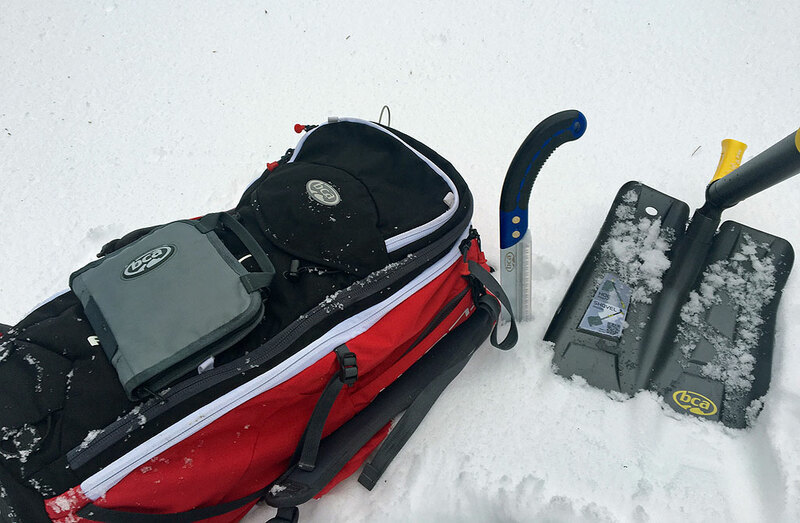 A prepared backcountry rider should have a, transceiver, airbag pack, shovel, probe, and other protective gear. They should also ensure that the people they ride with also have the same gear. Duffy notes that according to a Canadian study there is a 50 percent greater chance of surviving an avalanche with an airbag, if the airbag is deployed! Another study states that 30 percent of victims in an avalanche never deployed their airbag. Mike says the key to successful airbag deployment is to practice reaching for your airbag deployment handle a few times each day you ride, so the handle can be pulled without looking for it. This muscle memory is important for successful airbag deployment in an emergency situation. Airbags should also actually be deployed at least once a year to test the functionality of the airbag. Another key avalanche tool is communication. Most of the people we have been riding with this year have been using the BCA BC Link radio that operates on standard GMS and FRS frequencies. BCA didn’t invent the two-way radio, but it put it in a package that is perfectly suited to snowmobiling. We have been very impressed with the range and functionality of the BC Link. Riding groups won’t know how much they would communicate until they are all set up on radios, then it is surprising. Radios used to coordinate rapid avalanche search could be the determining factor to saving a life. 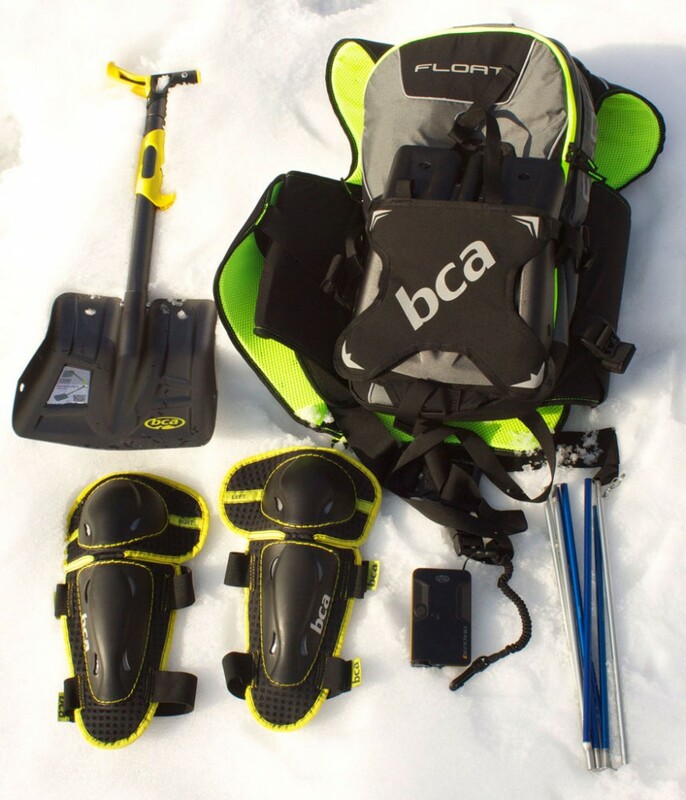 Backcountry enthusiasts that want to take Avalanche level 1 or 2 should consider expanding their avalanche gear to include a snow study kit, and a snow saw. 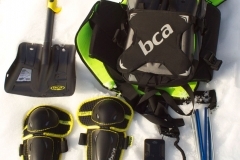 BCA’s Snow Study kit has nearly everything ready to go, in one convenient small package. Duffy says that avalanche education is reactionary, meaning when there is little snow or avalanches, there is little interest in avalanche courses. When there are avalanche fatalities, snowmobilers seek out the training and gear that they should have. For more information on avalanche training visit www.avalanche1.com. “Avalanche Essentials: A Step-By-Step System for Safety and Survival,” a backcountry avalanche book written by Bruce Tremper, is also a great resource.